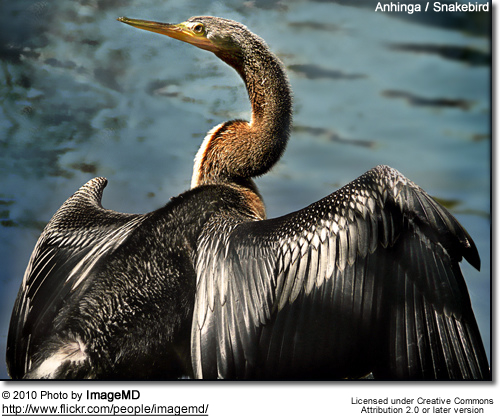 The Anhingas (Anhinga anhinga) are found in the warmer parts of the Americas. 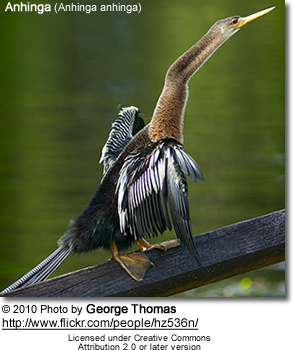 They are members of the darter family and are related to pelicans and cormorants. 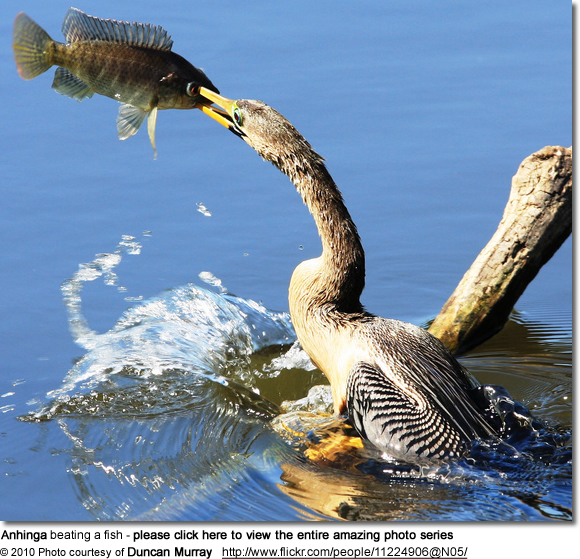 These water birds are also commonly referred to as Snakebirds, Darters, Water Crows, American Darters or Water Turkeys. 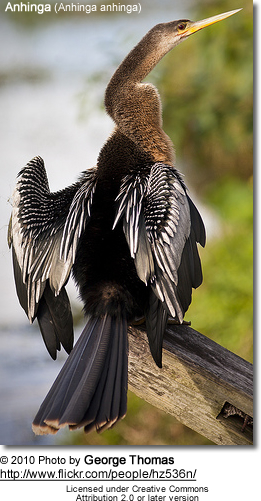 The word "anhinga" is derived from the Brazilian Tupi language and means devil bird or snake bird. The Creoles of Louisiana refer to it as "Bec a Lancette," on account of the pointed shape of the bill. 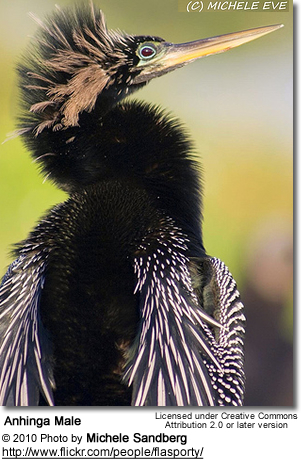 In Southern Florida, this bird is known as the "Grecian Lady." The name "Water Turkey" came from its swimming habits and broad tail. 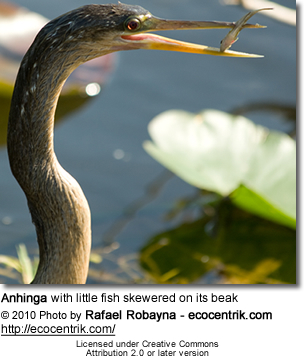 The name "Snake Bird" originated from its habit of swimming with the body submerged under water. They have dense bones and their heavier skeletons make it possible for them to swim or dive deeper in water than many other diving birds. Often only the longish, upward pointing head atop of the long, curved, slender neck are visible above water, as the move smoothly backwards and forwards like a snake. On rare occasions, their bronzy tail tips may emerge as they maneuver through the waters. However, Christopher Reiss - a retired Professor and volunteer at Shark Valley, Everglades National Park - sent us a series of photos, including the photo below where this gland is quite visible. These birds are most easily recognized by the way they are commonly seen in nature - after foraging in water, they stand still with their wet wings spread out in the sun. A misconception might be that they spread their wings after a swim to dry their water-soaked feathers before they can fly again. However, Professor Reiss observed them taking off with ease immediately after coming out of the water. 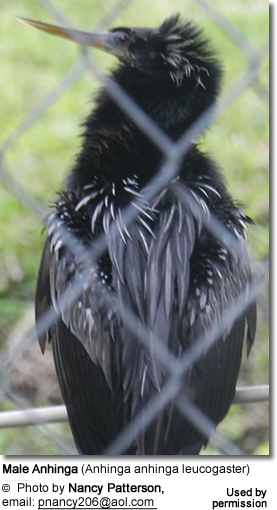 This obviously supports his theory that the plumage is quite water resistant. Therefore, this posture is likely to serve for thermo regulation more so than drying. In flight, they soar high in the sky achieving altitudes of several thousand feet. They travel long distances taking advantage of rising thermals - often without flapping their wings, very much in the manner of Vultures and Eagles. They are normally found in pairs or small family groups. However, they typically fish alone waiting patiently for prey to come within reach to capture them with their darting bills. They may feed near Cormorants and Herons. 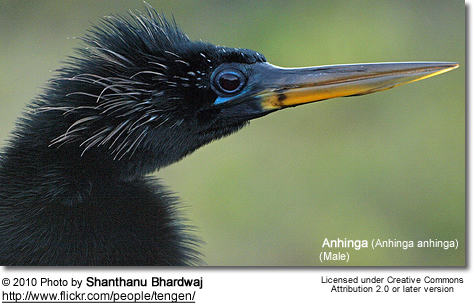 The Anhingas occur mostly in tropical and subtropical areas, but range into warm-temperate regions as well. 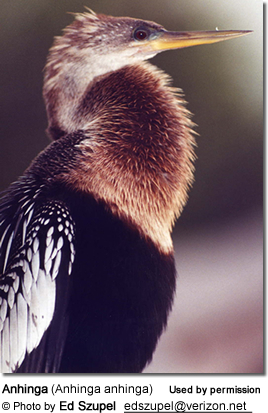 They are found along the coastal areas of Southeastern and South Central United States (Gulf of Mexico). Their range stretches from southern Virginia south through North and South Carolina, Georgia, Alabama, Florida, Mississippi, Louisiana and southern Texas; as well as along the Mississippi Valley north to Kentucky and Missouri. During the summer months, some individuals (typically juvenile males) have been recorded as far north as Pennsylvania and Wisconsin in the United States, and even in Canada. Their range extends south from the United States through Mexico, Central America (including some Caribbean islands) to the South American country of Argentina. They are resident (non-migratory) in some areas. Populations living in the extreme north and south of their range migrate towards the equator for the winter, in response to low temperatures and available sunlight. They are resident in: Florida, the lower parts of Louisiana, Alabama and Georgia, Texas, and mostly migratory in all other US States. 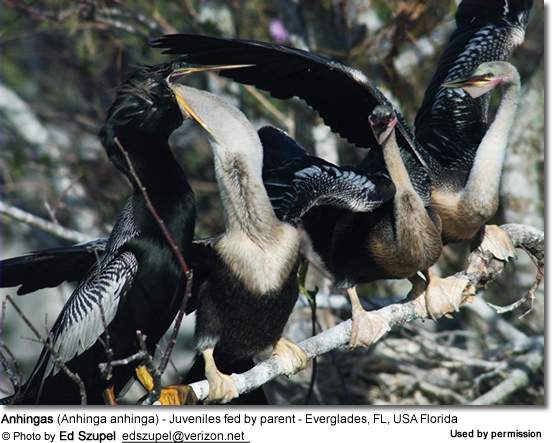 Kettles of anhingas often migrate with other birds. They favor warm shallow, slow-moving and sheltered waters and are found in open or partly open bodies of water with thick vegetation - such as bushes and tall trees - nearby for nesting, roosting and protection from predators. They are commonly found in freshwater swamps, lakes, brackish lagoons, sluggish streams and mangroves. They frequent fresh or brackish water (= slightly salty water, such as found in estuaries). They rarely occur out of freshwater except during severe drought conditions. They only feed in fresh water, but may nest in saltwater colonies. 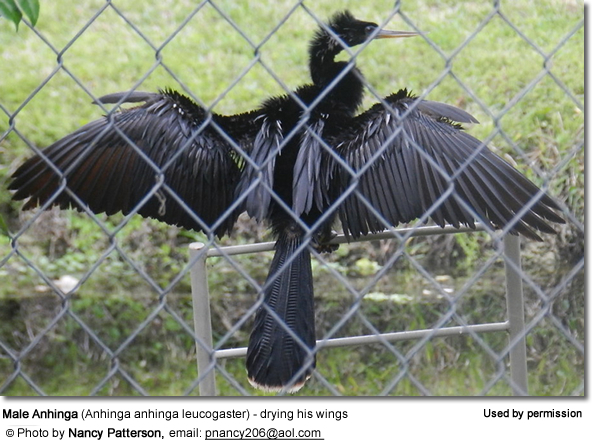 Anhingas are at risk of entanglement with discarded fishing lines and exposure to pesticides and other contaminants in their water habitats. Still, for the most part, their numbers are stable; except of declining populations in Arkansas, Mississippi, Oklahoma and Tennessee. In the United States, they are protected in the US under the Migratory Bird Treaty Act of 1918. Occur naturally in South America - from Colombia south to Ecuador and east of the Andes to northern Argentina. Also found on the islands of Trinidad and Tobago in the southern Caribbean off the coast of northeastern Venezuela. ID: Larger in size, with a broader pale tip to the tail. Found in southern United States (from Texas to North Carolina) through Mexico and Central America (down to Panama). Also occurs on the islands of Cuba (south of Florida) and Grenada (in the southeastern Caribbean northeast of Venezuela). 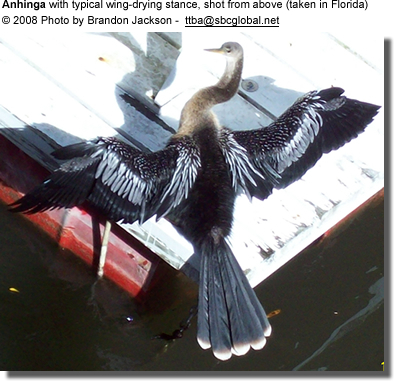 Anhingas are large, dark water birds that measure between 29.5 – 37.4 inches (75 – 95 cm) in length, have a wingspan of about 3.7 feet (1.14 meters) and weigh between 2-3 - 3.0 lbs (1.04–1.35 kg) - the average being 2.7 lbs (1.22 kg). Long, thin neck is S-shaped. 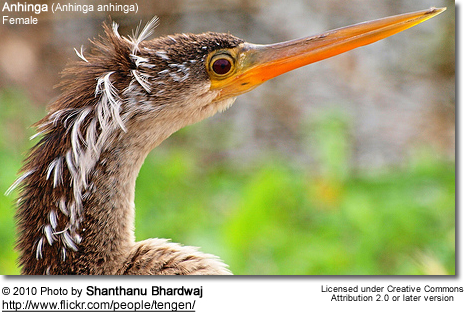 The yellow, serrated bill is about twice the length of the head and sharply pointed. The eyes are reddish. 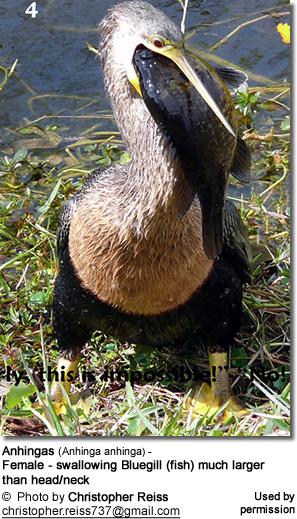 The yellow, three- webbed feet are perfectly adopted for both paddling in water and walking on land. Their well-developed claws (talons) maintain a strong grip as they perch on branches. One unusual plumage detail includes l corrugated feathers - two in the center of tail, and one each from the scapular (shoulder feathers) and 4 or 5 rippled feathers on each wing. 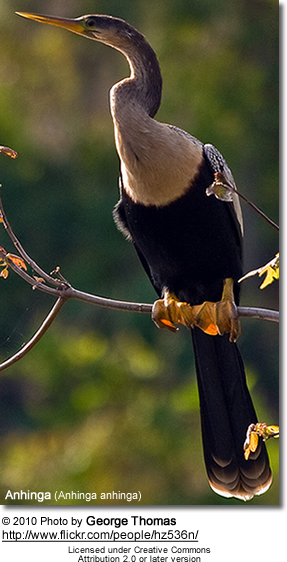 The male's plumage is mostly black with a green iridescence to the body and a bluish iridescence to the tail. There are white streaks and spotting on the wings and the tail feathers are tipped with a band of brownish-red that fade into white. There are elongated feathers on the back of the head and the neck that are grey or light purple white. The lower chest is chestnut colored. During breeding season, the eyes are surrounded by a bright blue patch of skin. The female can be identified by the pale grey-buff or light tan head, neck and upper chest; brown back and black stomach. Her bill is lighter than the male's. Hatchlings are naked, but they develop a tan down, which is replaced by white down within two weeks. When they are about 3 weeks old, the down is replaced by a light beige /cream body plumage (lighter than the adult female's). The body feathers darken as they mature. The silver white patterned wing markings that are typical of the adults are also growing in (yet initially shorter than in a mature adult's). Once the young fledge their nests, they most closely resemble the adults. At the end of the first year, their plumage rapidly turns tatty brown (referred to as "brown phase." Their full adult plumage grows in after a comprehensive prenuptial molt when they are about two years old and before their first breeding season (after their second or third winter). 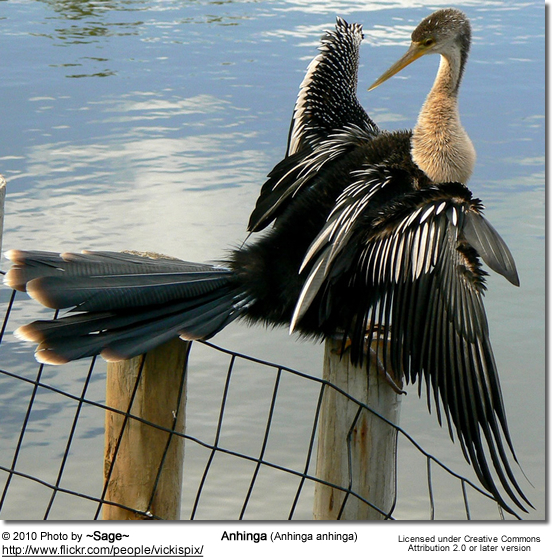 Anhingas are most similar to cormorants, but can be differentiated by their wider and much longer tails and their pointed bills, compared to the hook-tipped bill of the cormorant. 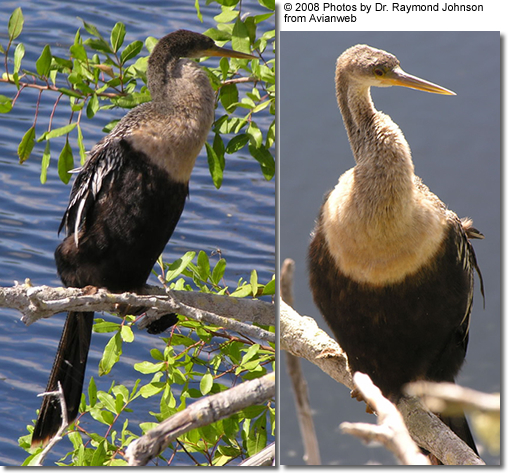 Cormorants have yellow markings on the face (near the bill) and lack the white spotting seen on the wings of the Anhingas. 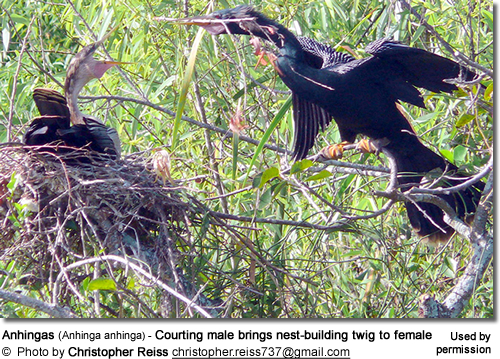 Anhingas reach productive age when they are about 2 years old. Once a suitable partner is found, they are monogamous - with pair bonds lasting a lifetime. Adults in breeding condition have blue rings around their eyes. In the tropical and subtropical regions of their range, they may breed year-round - basically whenever water-level conditions and temperatures are favorable for raising a brood. In the Southeastern United States, however, nesting typically occurs between December and August, peaking from mid-March to Mid-May. 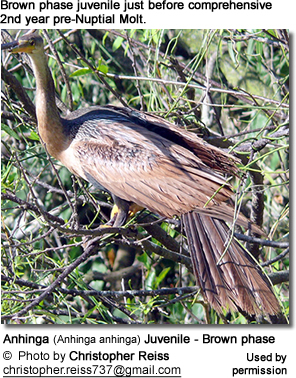 Anhingas commonly nest in loose colonies of several to hundreds of pairs - sometimes together with egrets, herons and other water birds. The males choose and prepare the nest site by collecting and placing the nesting material, such as large sticks and twigs in the forks of the nesting trees. As part of their courtship ritual, the male will soar high and glide in display for the female, and he will take nesting material to her for her to construct the nest with. The circular platform nest may measure 2 feet (0.6 meters) or more on the outside. The bottom layer typically consists of large sticks and the top layer of green branches with leaves on them, slender roots and other plant material. On the top, there is a shallow indentation that is then lined with fresh leaves, moss, green twigs, willow leaves and catkins. 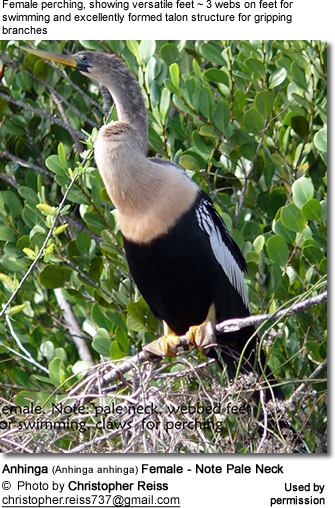 The nest is usually placed 4 to 20 feet (1 - 6 meters) high in trees that are either close to water or are overhanging it. Occasionally, they have been recorded to nest in bushes. 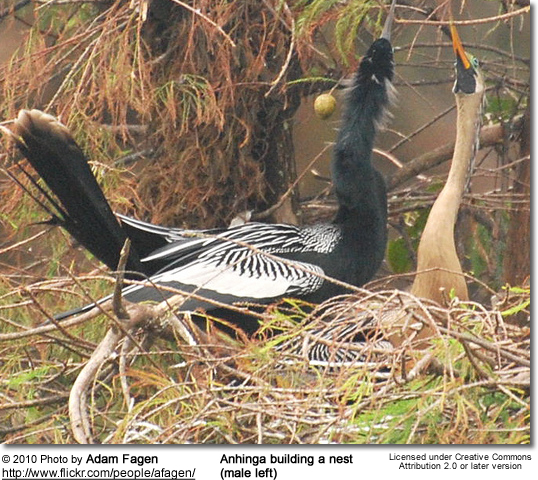 Anhingas may re-use nests over several seasons, and over time, excrement builds up on the outer rims of their nests, which then appear whitish in color. Sometime, they take over the nests of other birds and will add to the nests. The males will aggressively defend the territory around their nests. The female lays 2 - 6 (usually 4) oval-shaped eggs that range in color from light blue to pale-green overlaid with a chalky coating and occasional with brown speckles. The parents share the incubation duties which last for 25 - 30 days. The helpless and bald hatchlings are brooded by both parents for about 12 days after hatching, at which point they start to climb out of the nest. Both parents protect and feed them until fledging, which occurs when they are about six weeks old. The young remain with their parents for several weeks afterwards until they achieve independence. 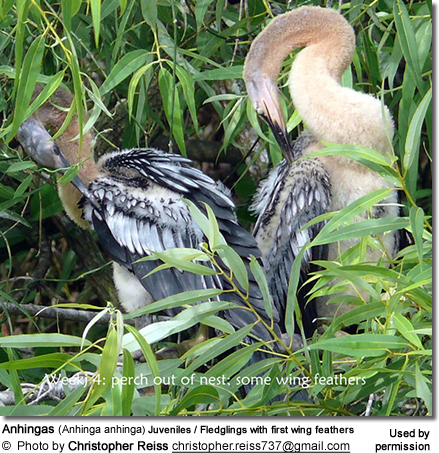 Anhingas primarily feed on slow-moving, small- to medium-sized wetland fish, as well as aquatic insects, cray fish, leeches, shrimps, frogs, frog eggs, tadpoles, salamanders, water lizards, small water snakes, and even young alligators and small terrapins (turtles). 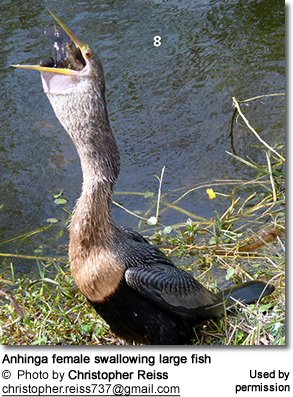 Anhingas are not fast swimmers and their hunting style is more of stalking rather than pursuit. They will wait patiently until they spot a prey close enough to use their quick, long and darting neck and sharp beak to capture the prey. Fish are often "speared" under water with a fast strike. Larger fish are usually stabbed with the entire beak (upper and lower bill), while smaller fish are often only stabbed with the upper bill. Captured prey is usually taken to the surface, flipped in the air, and then swallowed head first. Sometimes fish are stuck on the bill and they return to the shore with the fish still stuck on the bill, and they bang the fish off on a rock or other hard surface. Their calls are described as "grunting" or " raspy croaking."